Madrid, 11 de abril de 2019.- Más de 500 activistas convocados por Médicos Sin Fronteras (MSF), el Departamento de Geografía y Ordenación del Territorio de la Universidad de Zaragoza y Missing Maps han cartografiado zonas remotas en las que intervienen los equipos de MSF en Malí, Nigeria, República Democrática del Congo (RDC) y áreas damnificadas por el ciclón Idai en Mozambique. 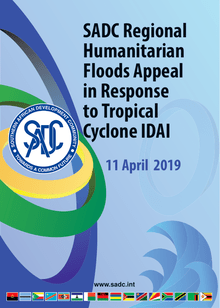 On 14 March 2019, Tropical Cyclone Idai pummelled through south-eastern Africa to become one of the deadliest storms recorded to hit Southern Hemisphere. 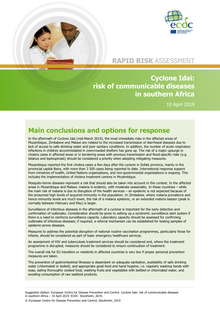 The cyclone caused catastrophic flooding, landslides and large number of casualties across Mozambique, Malawi and Zimbabwe. 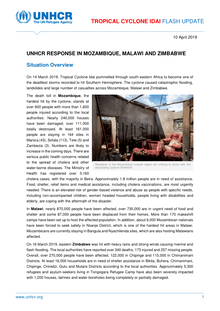 The situation in Mozambique is evolving rapidly, The information included in this sitrep below reflects the current understanding of the different groups as of 4 April 2019. 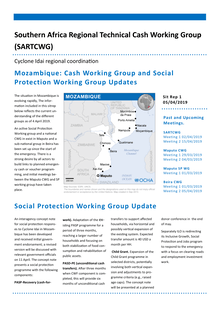 An active Social Protection Working group and a national CWG in exist in Maputo and a sub-national group in Beira has been set up since the start of the emergency. 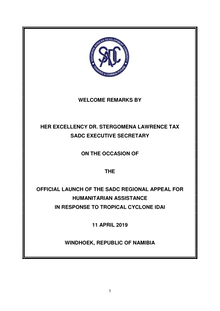 There is a strong desire by all actors to build links to planned emergency cash or voucher programming, and initial meetings between the Maputo CWG and SP working group have taken place. Six accommodations centres are opened in Guara-Guara, of which five were referred to as Transit Centres and the sixth as accommodation centre. As opposed to Guara-Guara only hit by the cyclone, the Buzi village was affected both by Cyclone as well as flash floods. 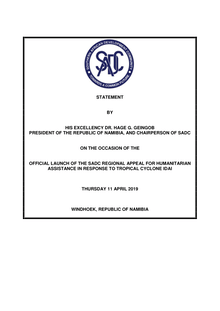 The government plan is to move the displaced population from Buzi and those living in lower lands to a relocation/integration site where the demarcation is presently taking place. 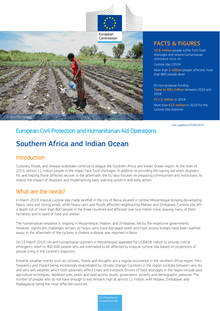 88 asylum seekers arrived during the month of February of which 85% were from the Democratic Republic of Congo (DRC). 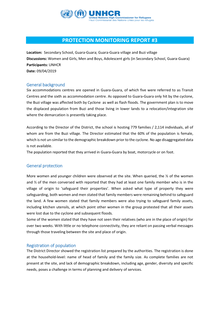 Between 19 – 20 February 2019, UNHCR conducted a verification exercise. 137 individuals (62M: 75F) were verified. 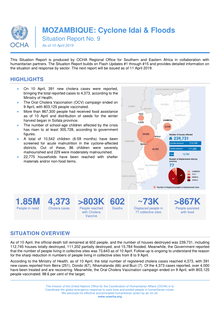 By 31 January 2019, 38,297 refugees and asylum-seekers were resident in Dzaleka Refugee Camp. 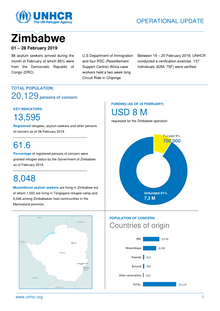 419 new arrivals and new born babies were registered in February 2019. 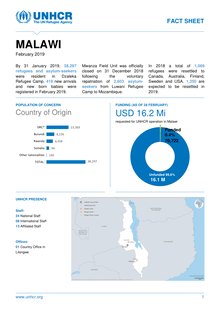 Mwanza Field Unit was officially closed on 31 December 2018 following the voluntary repatriation of 2,603 asylum seekers from Luwani Refugee Camp to Mozambique. In 2018 a total of 1,069 refugees were resettled to Canada, Australia, Finland, Sweden and USA. 1,250 are expected to be resettled in 2019. WASHINGTON, April 11th, 2019 – World Bank Governors representing Malawi, Mozambique, and Zimbabwe, international partners including the World Bank, the Department for International Development (DFID) of the United Kingdom, the Ministry of Foreign Affairs of Portugal, and the United Nations Office for the Coordination of Humanitarian Affairs (UNOCHA), convened today in a high-level round table on recovery and resilience in the three southern African countries affected by Cyclone Idai. 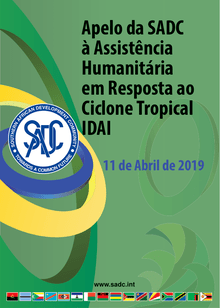 The SUN Business Network Mozambique (SBNMoz) gathered around 200 participants, including national businesses, government representatives, civil society and academia, at its 3rd annual conference, To discuss the challenges of improving nutrition in Mozambique. 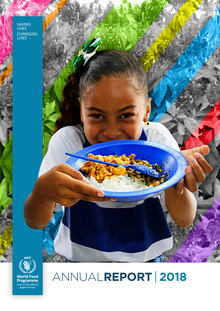 The theme of this years’ conference was “Food Systems as a Means of Promoting Nutrition in Mozambique”.